Then this crazy paperboy handed me a beautiful stack of handwritten recipe cards, and finally my brain cells started to kick in. “Oh, this isn’t the paper boy!” It was Eric, my husband’s co-worker. He and his wife Bethany had beautifully written down several of their favorite recipes to share with me, and he was dropping them off before bicycling to work. What a thoughtful surprise! This brownie comes from one of those pretty little cards. 1. Line a 9x13 inch pan with foil and brush lightly with oil. Pre-heat the oven to 350 degrees or to brownie box directions. 2. Prepare brownie mix for chewy brownies. Bake according to box directions. 3. Remove from oven and sprinkle with the marshmallows. Bake for another 5 minutes. Remove from the oven and cool completely, or until marshmallows have solidified. 4. Melt chocolate chips, peanut butter, and butter in a saucepan over medium low heat stirring frequently. Turn off the heat and stir in the cereal. Pour over the brownies and smooth out the mixture. 5. Refrigerate until the topping is set. Carefully remove the brownies from the pan by lifting the foil. If they are too soft to be removed, freeze for 30 minutes and try again. To cut, brush a chef’s knife with oil and cut into strips, then into squares. Repeat with the oil as needed. Recipe via Eric and Bethany Newell. Pictures by Laura Flowers. Cool Lori! This is a pretty fun brownie. I hope you enjoy it. Thanks for sharing..I can think of no one in my family who would NOT love those ..little boys included! They love chocolate and marshmallows. How nice of you to be parading them so soon..And in great shots! Where's the overload? I don't see an overload. Looks perfect to me! I think I'll be whipping this up this afternoon. Those look like they might be a little bit sinful! They look perfect! I'm with Ginger, they need to be published. This looks over the top!! oh goodness I'm making these like tomorrow. they look amazing! Thanks for the comments! I enjoyed them. Most of these will get published hopefully. I'm putting a book together, but that doesn't always mean it will make it through the system. Wow, pure decadence. Can't wait to see the other recipes they brought you. Oh my goodness, these look divine! Adding them to my to-do list right away! Oh my, oh my... the family is going to love these!!! My! You are brave to answer the door at that time! I think you should have called these Heaven! Wow! I wish someone would come to my door and give me a stack of recipe cards with recipes like this! Yowzer do these look outrageously great! I linked this recipe to my best friend and she had to make them. These were delicious!!! They were moist, chewy, gooey, crunchy, and nutty from the PB. I loved the marshmallow layer. This was a great recipe, thank you for sharing!! I am so glad your friend liked them! Thank-you for letting me know. Yipee... another way to get fat. This is the food version of Captain Planet. I'm SO going to make these over the weekend! I'm really sorry you had problems with the top layer. The top layer was a bit difficult to spread around for me, but it sounds like you had much more trouble. I can think of two things perhaps. One, try adding less cereal to the chocolate peanut butter mixture. Or/and warm it up a little if it's started to cool down. I hope this helps. I hate it when something I'm cooking doesn't turn out and I have to start over. My roommate and I just made these, and they were sososo delicious. Thanks so much for sharing!! YUM! A friend of mine posted a link to this on facebook and I had to track down your site to look at this again. I think I may have to make these before I start my diet! Now I've gotta look on here to see if you have the option to sign up for your blog posts via email. That would be a treat!! Thanks for leaving a comment on these things. I was wondering if anyone looked at this one anymore! I think you can go to the rss feed button on this page and get it by email but I'm not certain. 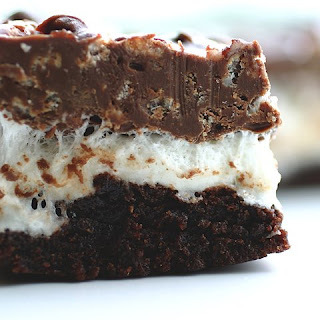 These brownies are wonderful, but I use a jar of marshmallow fluff for the middle - makes it WAY MORE gooey! They are setting up in the fridge right now! 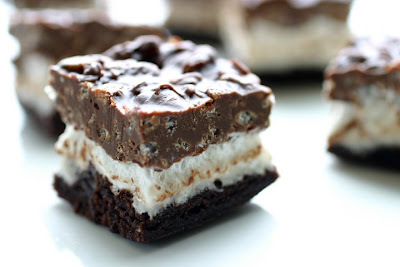 These are so delicious...however, next time I make them I think I will double the chocolate/PB/cereal topping. I hardly had enough to cover the entire pan!